According to the requirements of American students and parents, Hope Education Foundation (HEF) has succeeded in arranging many students to study Chinese one by one in Beijing. 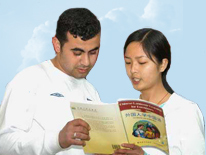 By 82-day studying, it is obvious to see the improvement of Chinese in reading, writing, and speaking. And at the same time, students will establish the friendly relationship with teachers and students. So American students will maintain a sustain studying and practicing Chinese by contact Chinese friends online. Hope Education Foundation (HEF) is a professional organization established by American and Chinese entrepreneurs to help foster cultural and educational exchanges between the United States and China. The goal and objective of HEF is to provide opportunities for interactions between American and Chinese educators, artists, and individuals in order to promote understanding and knowledge via direct people-to-people interaction.